I need to preface this post. 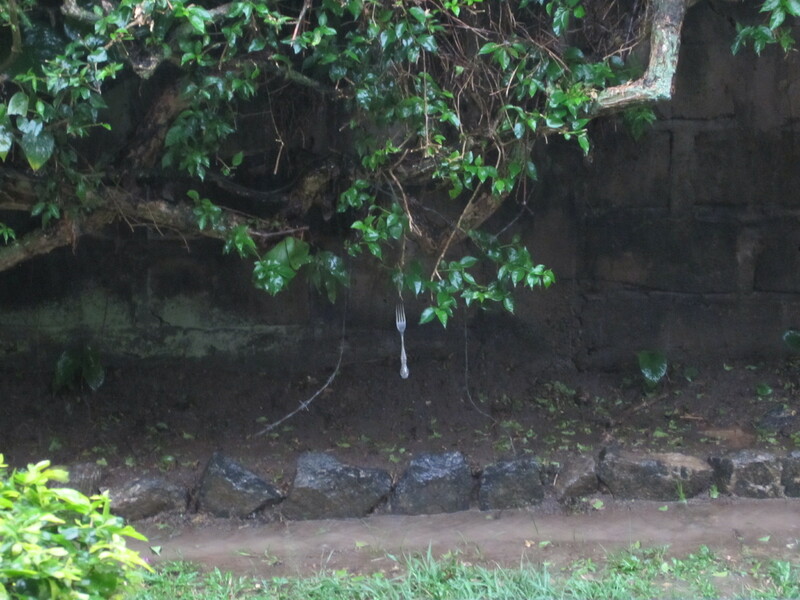 About three months ago Jonah was running down to the gate with David’s keys in hand, pumping his arms and oops the keys slipped from his hand and into the big bushes that line the wall in front of our home. Not only are these bushes full, they have thorns and the barbed wire that used to adorn the top of the wall is now entangled in the bushes. We searched for hours without any luck. We ended up changing all our locks. We had a rain (downpour) the other day. We grew up saying it’s raining cats and dogs. In language study we asked an instructor what the equivalent is in French and it was something about cow pee. I was on the porch with the boys, watching a small pond form in our front yard and then I noticed something under the bushes. So I think we can say, it’s raining forks! It’s not our fork so either a neighborhood kid threw it into the bushes or the previous residents lost it in the bushes. I went looking for the keys, but they didn’t come down with the rain. Maybe next time, it’ll rain keys. 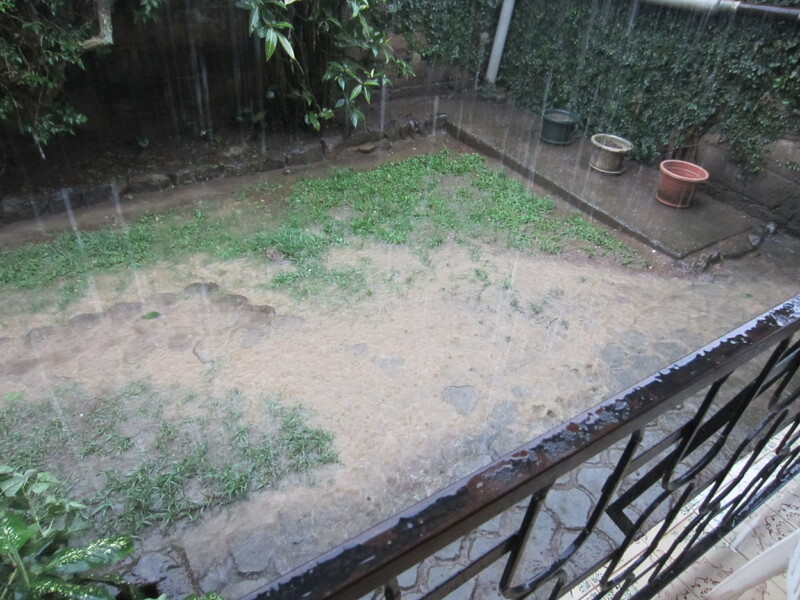 This entry was posted in Cameroon, home and tagged Cameroon, Home, Rain. Bookmark the permalink. 6 Responses to It’s raining….. It does not look like one of ours! So I am going with a neighbor or from someone that lived their even longer ago. My mom always used to say “It’s raining pitchforks and hammer handles”! At least you didn’t get those in the yard! Whether it’s raining cats and dogs, forks, keys or cow pee, it’s all still very wet according to the picture. Hope you find your keys.